Find research publications and scientific articles about ILC curated by LBCA’s Scientific Advisory Board. This list will be periodically updated and expanded. Check back for updates. 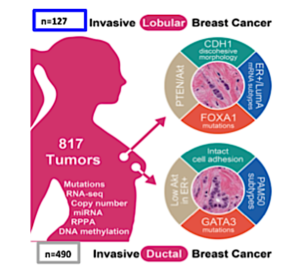 The Cancer Genome Atlas (TCGA) ILC working group recently performed comprehensive analyses that revealed clues about the etiology of ILC. Some of their main conclusions described major mutations present in ILC clinical samples. This professional reference article offers a discussion of the biological differences in ILC and how those differences affect applied treatments. The American Association of Clinical Oncology (ASCO), the professional organization representing physicians of all oncology sub-specialties, has granted LBCA permission to share their publication which is published in the 2016 ASCO Educational Book. Reprinted with permission. © 2016 American Society of Clinical Oncology. All rights reserved.